Renaissance Mysteries: The Old Woman in Titian's "Presentation"
There is no mystery about the subject of Titian's famous version of "The Presentation of the Virgin". It is a depiction of the legendary account of Mary's dedication to the temple by her parents, Joachim and Anne. 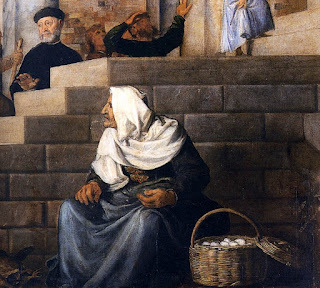 According to the legend the prayers of the barren couple were finally answered, and in thankfulness they offered the child to the Temple where she would be raised in service to the Lord. The presentation was supposed to have occurred when Mary was weaned at about the age of three, but painters usually depicted her as somewhat older. 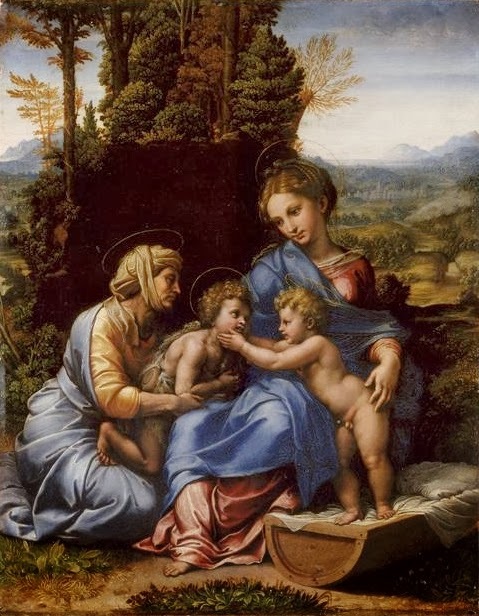 Here is Anna Jameson's description of Titian's version from her "Legends of the Madonna." There was a prophetess also, Anna the daughter of Phanuel, of the tribe of Asher, she was well on in years. Her days of girlhood over, she had been married for seven years before becoming a widow. She was now eighty-four years old and never left the Temple, serving God night and day with fasting and prayer. she came by just at that moment and began to praise God; and she spoke of the child to all who looked forward to the deliverance of Jerusalem. Do the eggs represent a problem for this identification? There might be a reference in the legends, or they might be symbolic, but I suspect that they refer to the sacrifice mentioned by Luke at the Presentation of Jesus: "a pair of turtledoves or two young pigeons." Perhaps Anna was thought to support herself by supplying these birds. I think it would have been perfectly natural for the legends to place a Temple denizen who had been present at the Presentation of Jesus at the scene of the Presentation of his Mother only a few years before. In another legend popular at the time the two thieves who were crucified alongside of Christ were believed to have been the same two who had waylaid the Holy Family on the flight into Egypt 30 years before. 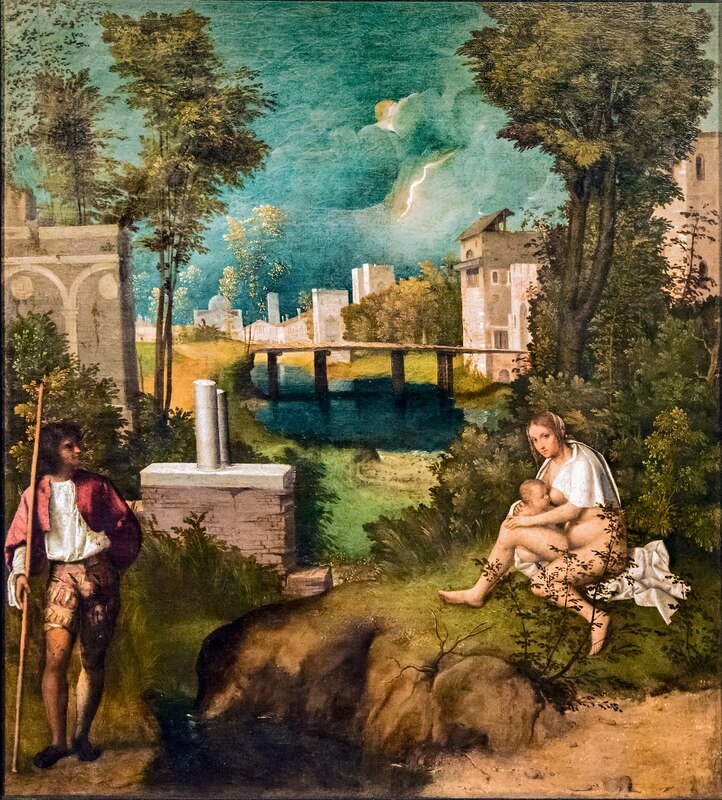 See my discussion of "Discovery of Paris" or the Encounter with the Robbers at MyGiorgione. My original post was to draw attention to David Orme's wonderful discussion at art-threads.co.uk of the artistic renderings in Renaissance Italy of the apocryphal legend of the Presentation of the Virgin. Titian's version above is perhaps the most famous but David reproduces some equally marvelous versions especially one by Tintoretto. He includes an explanation of the 15 steps so commonly used. Although Titian's version only seems to contain 13 steps, there are two more behind the priest at the top. David's discussion of the Presentation is included in his section on the Life of the Virgin and Childhood of Jesus. *Anna Brownell Jameson, Legends of the Madonna, as Represented in the Fine Arts, Boston and New York, 1885. pp. 265-6. **Pedrocco, Filippo: Titian, NY, 2000, cat. entry #105. Renaissance Mysteries: Raphael's "Vision of Ezekiel"? Although most of my work has centered around Giorgione, Titian and the Venetian Renaissance, my acquaintance with Hasan Niyazi and his popular Art history blog, Three Pipe Problem, led me to consider and re-interpret a painting usually attributed to Raphael. Hasan, who died tragically and unexpectedly last week at the age of 37, was a great fan of Raphael. Actually, he was much more than a fan. Besides his work at 3PP, he was in the process of creating a complete Raphael database. On June 6, 2011 Hasan posted an account, "Raphael's Vision and an Italian Storm," of a controversy in Italian art history circles concerning "The Vision of Exekiel," a painting usually attributed to Raphael or to one of his circle. On reading his account I was surprised to see that despite the controversy, no one questioned the subject or title of the painting. It seemed to me that rather than the vision of Ezekiel, the subject of the painting was a vision of John from the Book of Revelation. I prepared a little essay and sent it off to Hasan and he agreed to post it as a follow up on his site. It appeared on June 10, 2011 as "Re-examining the Vision of Ezekiel." Understanding the real subject of the painting also shed light on its connection with a Madonna and Child with John the Baptist and Saint Elizabeth attributed to Giulio Romano. Although separated today, the paintings seem to have been originally conceived as a pair. The meeting of the infant Jesus with John the Baptist in the desert marks the beginning of the public life of Jesus. The vision of John on the isle of Paphos marks the climax of the life of Christ. To me this fruitful interaction is one of the great advantages to online discussion of art history. Use the links above to read the two posts and decide if the painting should now be called "The Vision of St. John on the Isle of Patmos."